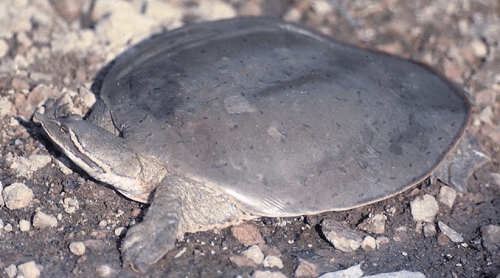 Compared to other turtle species, the smooth softshell turtles are large. The carapaces of the females grow up to 14 inches in length. The male Smooth Softshell Turtle carapaces only reach half of this length. It is very easy to recognize these turtles from the smooth appearance of their carapaces. The carapaces do not have the bony scutes like other turtles. They are leathery and flat with edges that are very flexible. The carapaces are completely smooth. Their noses tapper to a point and there are no ridges in their nostrils. The adult males are brown or gray and have small dashes and dots on the backs. Adult female are drub in coloration and have big dark blotches. Both the males and the females have light lines on the sides of their heads. One line is behind the ear and the other begins just under their snout. The feet and the neck are not patterned. These turtles live in rivers, large lakes and large streams that have muddy or sandy bottoms. They need sandbars for basking. They also act as places for them to lay their eggs. These turtles are very active between April and late October. They usually bury themselves in mud or sand at the bottom of rivers or lakes when they don’t want to be disturbed. They are a wary species and will immediately jump into the water when they feel threatened or disturbed. The Smooth Softshell Turtles are very fast swimmers. When they are picked up, their fist response is biting and scratching with vigor. That is why it is important to handle large specimen with care. The turtle should be held away from the body, with its face away from the fingers. These turtle hunt during the day and sleep during the night. These turtles are mainly carnivorous. They feed on almost any aquatic animal who size they can handle. They feed o small fishes, aquatic insects and plants. The amount of each type of food that a given turtle feeds on depends on its environment. Crayfish is particularly one of the favorite foods. They use their front limbs to tear larger prey such as crayfish apart before feeding. When kept as pets, they can be fed with insects, plants and commercial turtle pellets. These turtles breed from May to July. The females lay eggs in bunches that may have 3 to 28 eggs. The eggs are laid about 100 meters away from water in areas that are sandy. Before laying of eggs, the females will dig nests on sandbars that receive sunlight. However, most of their eggs are eaten by carnivorous mammals. Their eggs are brittle and are shaped like ping-pong balls. The eggs hatch between August and September. When kept as pets, it is important to provide them with a basking area. Good water quality should also be maintained to ensure that they stay healthy. Since they like to hide in sand, their aquaria should have sand substrates that allow them to completely bury themselves. They should be protected from dogs, cats and other carnivorous pets.